The Spinsterhood Diaries: #FAFATL: I'm Back! When things got busy at work, I had to lay off the Free Art Friday (#FAFATL) business for a little while. However, I had a little time to make some brand new magnets this week, and I'll be posting them around Atlanta today. 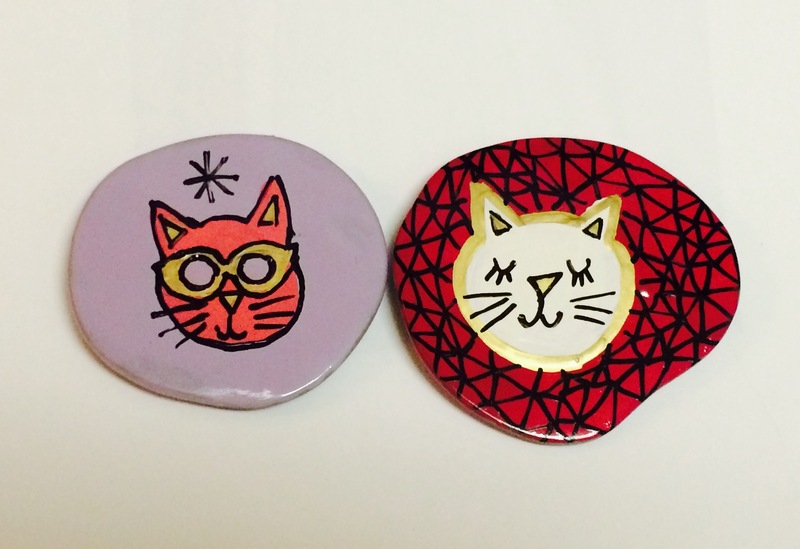 On the left, we have a lavender magnet with a pink cat who is wearing gold sunglasses with lavender lenses. I took this photo last night, but I have since seen fit to add glitter. You know...because it's generally necessary for living. On the right is a white cat with a gold nose and a gold outline on a pinky-red background decorated with a sort of web of triangles. If you fancy a little free cat art and are in the Atlanta area (or you just want to see pictures of Miranda the cutest puppy in the world), you can follow my Instagram: @Jonezee85. If you want to see what everyone else is dropping around town (not, like, groceries, keys, and cell phones - I mean art), you can search the hashtag #FAFATL on Instagram, Twitter, and Facebook.